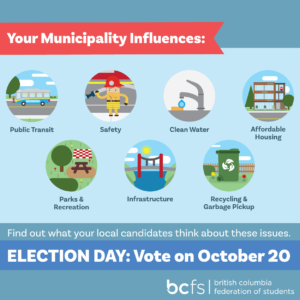 We all know the importance of civic engagement and we make our voices heard in provincial and federal elections, but what about municipal elections? Sometimes, it’s hard to know what our locally elected city officials do and yet there are important decisions made that impact our lives everyday! Municipal elections can be the most challenging level of government elections to talk with members about. Why? Well, it seems that while people can typically see how policies and legislation of the provincial and federal governments affect their lives, many people aren’t aware of what their city or town councils actually do. Beyond that, there are many positions we are voting for: depending on where you live, you might be voting for councillors, mayor, regional districts, boards of education, park boards, and community commissions. That’s a lot to learn! This municipal election, let’s make the most of this opportunity to speak with members. Some basic discussions can be an eye-opening experience for members and could spark their desire to get informed and to vote! why do we have local governments? Whether you live in a rural area, in a small village or town, or in a large urban centre, local government is tasked to take care of community needs. • Specifically, local government (municipalities and regional districts) shapes communities by offering essential services, regulates local policies, regulates land-use/development, and plans for the future economic growth of the community. what else does the municipal government do besides services? how does the municipal government pay for all of these things? how can i find out what my local government is working on? You can read the municipal annual report! Municipalities are required to prepare an annual report, providing information on finances, taxes, services and operations, and objectives and measures met during the year and those set for the next year. Campaigning for the municipal elections officially starts September 22, though you have likely already seen many candidates campaigning in your area. Campaigning will run all the way until October 20. Voting day – the most important date to know – is Saturday, October 20. Voting Day is October 20, 2018 – Are You Ready to Cast Your Vote? 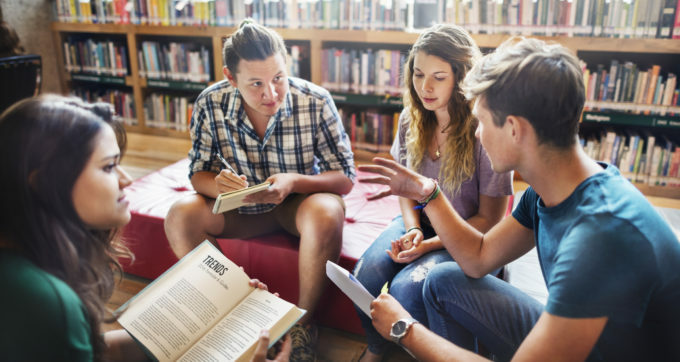 Students who live in one jurisdiction and attend an educational institution in a jurisdiction different from their usual place of residence may vote only once–either in the jurisdiction where they attend school or in the jurisdiction that is their usual place of residence. Get on the Voters' List! Register and update your information with Elections BC to ensure you are on the Voters' List for October 20!